When I first started telling people that I was leaving my job to start this consultancy, I also was serving on the board of a nonprofit. At one of our social events, the spouse of a board member seemed very focused on quizzing me about this apparently shaky new venture. Did I have clients? Did I have a reserve fund to get started? Did I have an office set up and administrative help? Had I researched my prospects? Was I prepared to market my services? I was feeling pretty proud that I could answer each question--I'd done my homework. But despite my positive answers, each one got the same reaction from her: "Oh, I could never do that." Over and over. Until finally, I leaned forward, patted her hand, and said, "Don't worry. I won't ask you to." Later, it occurred to me that that conversation wasn't about me at all, but more likely about her fear that her husband--partner in a big DC law firm--would get it into his head to leave and go independent. The idea of leaving your workaday job to go independent may be infectious, but it isn't necessarily easy. In this, my second turn at independent work, the business has weathered the Great Recession and my breast cancer, stretched across the globe, and expanded exponentially. But you can forget work-life balance: It's put years back on my life, in the form of less stress and more joy, creativity, variety, and opportunity. I can't have office politics or gossip with myself. And I can say that my work involves exactly what I love to do, and eliminates those tasks at which I excel, but don't care for so much. I say "no" to work that doesn't feel right or meet my parameters, and my work schedule is still full. And I really, really like and respect my boss. Time is growing short. There are unexplored adventures ahead of you. You can’t live the rest of your life worried about what other people think. You were born worthy of love and belonging. Courage and daring are coursing through you. You were made to live and love with your whole heart. It’s time to show up and be seen. Or as writer Anne Lamott said so well, "What if you wake up some day, and you’re 65… and you were just so strung out on perfectionism and people-pleasing that you forgot to have a big juicy creative life?” What if, indeed. 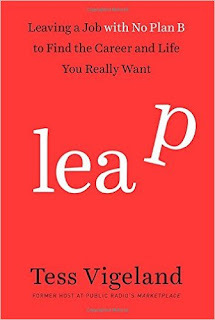 Recently, I was catching up with radio host and reporter Tess Vigeland's book Leap: Leaving a Job with No Plan B to Find the Career and Life You Really Want for my public speaking blog, The Eloquent Woman. Vigeland left her plum job with public radio's Marketplace with little planning and no real Plan B, and gave a speech soon after her leap about what that felt like. I wanted to blog about the speech. But the book did something else for me, turning into a nice review of why I'm so glad I made my own leap. My own leap had plenty of planning in advance. One advantage of having had a successful stint as a freelance journalist early in my career meant I knew enough to plan. But it still felt like a leap. Today, I field calls from former colleagues or current clients who are mulling a leap. Some take it and thrive, some try it and go back to a steady job, some don't venture forward. All of them would benefit from reading this thoughtful book. Vigeland shares her own process, talks to experts about transitions like hers, and finds others who've tried it to share their experiences. Along the way, this book is the thinking-through process that you need, even if you never make the jump. You might need it to realize why you want to stay where you are, or to give you the courage to leap, or at least try planning for it. You can order this book in many formats, but the audiobook lets you get the advantage of Vigeland's great radio voice in the bargain, as well as the live recording of her speech about the leap she was making. My leap happened after I won a top career award...at age 42. I wondered what was next, then remembered that when I left journalism for a new career in communications, I had promised myself that I'd go back to my own writing, and working for myself. Making good on that promise has been my best decision ever. Year 13 of my business starts three weeks from today. How can we work together in it?